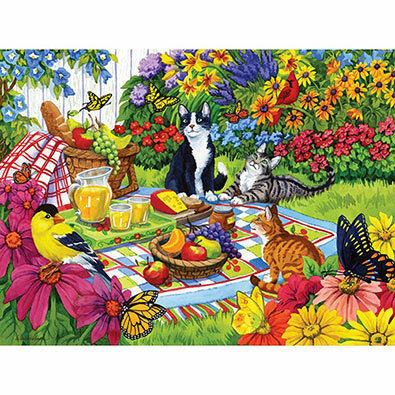 This 500 piece jigsaw puzzle is designed by Nancy Wernersbach and measures 46cm x 61cm. Available in two piece count. This 500-piece jigsaw puzzle is designed by Nancy Wernersbach and measures 46 cm x 61 cm. Spring is in bloom, as a variety of birds sit on a colourful tree in front of a comfortable cottage. Garden Full Of Butterflies is a 500 piece jigsaw puzzle designed by artist Nancy Wenersbach. An ornate white garden bench in the middle of this garden is surrounded by blooming flowers. Butterflies are flying and perched on the blooms in this colourful scene. Each 500 piece jigsaw puzzle is designed by Nancy Wernersbach and measures 46cm x 61cm. Available in two piece count.